Our next Meeting, 19th May 2012 will be at the Chermside Library. Please note, new time, meeting will start at 10am till 1pm. Marg; 0402 336 480 for more tetails. On Friday 4th May 2012 the RBWH Foundation launched their new Royal Mums book 2. Dr. David Alcorn Executive Director wrote, "I am proud that in 2009 Executive Director of Women's and Newborn Services, Professor Ian Jones , made history in leading RBWH to being the first Australian hospital to apologise to unmarried mother for ill treatment experienced during their pregnancy and confinement at the Royal Women's Hospital." Page 69 of the book is dedicated to Forced Adoptions. It also features the photo of Prof Jones, Noelle Cridland,(the then director of Nursing for Women's & Newborn Services) and Members of Adoption Loss Adult Support, Trish, Margaret, Janice and Lorraine who accepted the apology on behalf of their members. Page 70 contains the experiences of Margaret Oakhill-Hamilton and Patricia Large along with the Apology. We are very grateful to the foundation for including the summary of the inquiry report into forced adoption and the sensitivity shown to us when we asked for our experiences to be told. The Royal Mums books can be purchased through the RBWH Foundation. 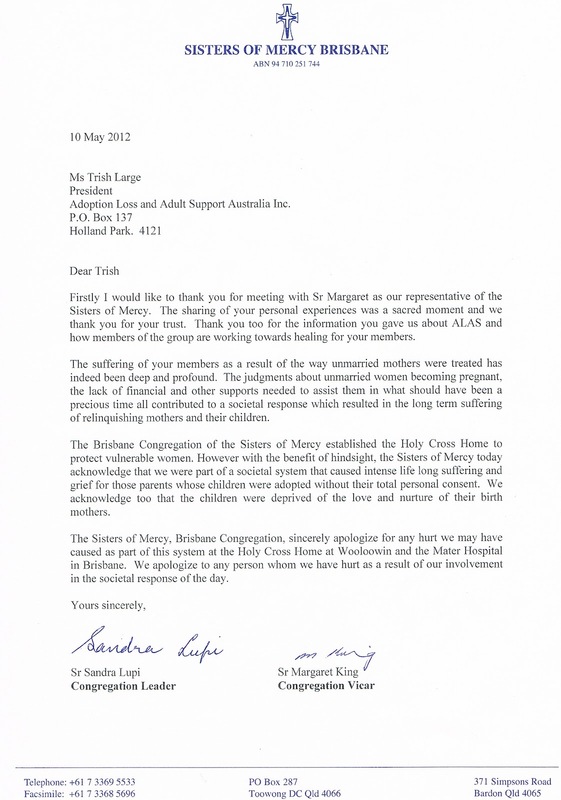 ALAS BELIEVES THAT THIS APOLOGY MAY BE THE FIRST EVER ISSUED TO UNWED MOTHERS IN THE WORLD.